Our Coleman Xtreme Marine cooler review will provide you with a description of the unit, some of its most useful features, users’ opinions, and additional lists detailing our favorite things about it or what we would like Coleman to improve. There are lots of ways you can enjoy your summer vacation if you have the right cooler with you. This Coleman product will provide you with a way to haul a lot of ice and beverages with you for several days without melting. The Coleman Xtreme Marine cooler is only available in four color schemes: grey, white, brown, and blue as primary hues. It is 36.25 inches long, 18.5 inches wide, and 16.88 inches high in total. The cooler weighs 21.85 pounds during shipping but is a little lighter out of the box. Remember, this is the weight of the Coleman Xtreme Marine cooler before you fill it with ice, food, or beverages. Coleman uses a single piece of “Rotomolded” polyurethane plastic. Aside from the handles on the sides, there are no joints that might stress the unit in certain situations. This construction enhances the cooler’s overall durability and should increase its longevity as well. Recommended for:We feel that the Coleman Xtreme Marine cooler has a price point that makes it a great choice for just about anyone. However, it is particularly useful for anyone who is serious about hosting large parties out on the patio during summer or goes backpacking in the wild for extended periods of time. 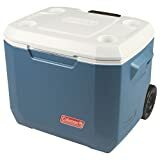 If you are going to be traveling in a large group or you are usually gone for days at a time, the Coleman Xtreme Marine cooler may be the best option for you. This section of our Coleman Xtreme Marine cooler review will list some of its main features and how they work. We provide this section so you can get a general idea of the cooler’s benefits. Insulation is notably thicker than some other Coleman coolers. Even the lid of the cooler comes with has its own insulated system. The lid has a cup holder at each corner for added convenience. It can hold between 30 and 50 smaller beverage bottles and several two-liter bottles. The cooler features a leak-resistant drain hole that you normally find on larger models. The plastic construction provides a high level of durability to the product. Under optimal conditions, it can keep ice from melting for as long as five full days. The specialized lid of the cooler can support up to 250 pounds. Note that this list details just some of the best, most obvious advantages of the Coleman Xtreme Marine cooler. The durable construction of the product combined with its superior insulation means that it will last a long time and increase its overall usefulness. Most users claim they can fit as many as 50 small bottles in the cooler. You may be able to fit more than that inside if you pack the ice in a particular way. On top of that, it is likely the cooler will hold an even greater number of 12-ounce drink cans. The Coleman Xtreme Marine Cooler works similarly to other coolers in its category. However, it has the added benefits of extra long ice retention and a durable outer shell that can withstand both the elements and hard impacts. You can fill the cooler to capacity with ice in the shape of your choice or pack it strategically for maximum holding room. Note that you can use the lid of the Coleman Xtreme Marine cooler as a miniature table or bench up to its weight limit of 250 pounds. The four cup holders further add to the versatility of the cooler’s lid. A convenient drain hole at the bottom of the unit allows you to empty water without any trouble. As we expected, the ice retention factor is a major selling point for many experienced users of the Coleman Xtreme Marine cooler. While our tests only kept ice solid for about five days, some users report that they could still use their ice even after six days or more. The only complaints most users had concerned the same issues we found regarding the handles and hinges. While these design flaws do not compromise the effectiveness of the cooler, they may influence its overall durability. All in all, the Coleman Xtreme model remains a solid choice. Ice retention capability – During our tests on the Coleman Xtreme Marine cooler, we discovered that it can keep ice in a solid state for as long as five days in total. This cooler is able to keep ice from melting longer than some of the top cooler models on the market today. We did note that ice retention was somewhat dependent upon individual usage. You can expect the cooler to keep your ice solid for over four days with proper usage. Rugged construction – One thing we liked about the way Coleman constructed their Xtreme Marine cooler is the no-frills design. Its rugged construction makes it suitable for backwoods trips or harsh outdoor environments. The heavy-duty rotomolded plastic should withstand drops, shocks, the elements, and small animal attacks with ease. Versatility – The Coleman Xtreme Marine cooler is not only good for a number of uses, but it might be an ideal choice for almost anything. You can use it for pool parties, long road trips, camping with minimal resources or spending several days on a boat. There’s not much to dislike about this product, but our Coleman Xtreme Marine cooler review would be incomplete without a few things that we would change. Our biggest complaints are the way the handles hang from the cooler and the hinges that support the lid. That’s because the geometry of the cooler makes it difficult for the handles to hang straight down from the body of the unit. Keeping the handles at an awkward angle may put unnecessary stress on them that could weaken their integrity over time. As some users noted in their reviews, some of the bolts had a rare tendency to slide out of the hinges after a few flips of the lid. The latest collection of the best small ice makers for office. A close look at a similar product with different specs, Yeti Roadie 20 cooler. Truth be told, the Coleman Xtreme Marine cooler could benefit from different geometry and stronger hinges. On the other hand, few coolers can rival its solid construction and ice retention features. It is also one of the most versatile coolers we’ve seen. Please share your thoughts and experiences with us in the section below.